If you've ever fallen in love with a place while on vacation and wondered what it would be like to live there for more than a usual vacation's worth of time, you're my reader. Step right into a vicarious travel experience as Larry Lawyer and I try to make ourselves at home in Provence. Stay with us -- we've got a virtual guest room -- as we spend a month in each of four consecutive years in the pretty, medieval town of L'Isle sur la Sorgue - pronounced 'Leel sur la Sorg' - in the heart of Provence." Don't worry if you can't speak or understand French. Hang out with us for a while and you'll speak it as badly as we do. I don’t know about you, but no matter where we’re traveling, especially if we’re having a wonderful time, we invariably stop at the local realtor’s office to peer at the listings and indulge in a one month rental fantasy. We choose the house we like best, convert the price from euros to dollars, and then fly home and forget entirely about our dream until our next one week vacation. My husband, Larry, and I don’t want to tour a foreign country, we want to become part of it. We want to pierce the tourist veil, get as close to the essence of the culture as we can. No more observing from the outside, our noses pressed to the glass. We yearn for someone to open the door and invite us to step right in and make ourselves at home. To accomplish this would take time, more than the week we usually allot for a vacation. It took decades before we put our fantasy to the test of reality. By then both of us were in our low 60’s, right on the cusp of being late middle-aged and young-old. But since 60 had just become the new 50, perhaps we were merely late middle-aged. We had raised our children. We had solidified our careers. We had saved enough money so that we could travel. We were still in pretty good shape, probably because we enjoy physical activity. We swim. We ride bikes. We hike. We have arthritis. We pump up the volume on the TV. We are beginning to hear from our rotator cuffs. Couldn’t we have at least one last great adventure before all we can do is try to balance on our walkers on the decks of cruise ships? 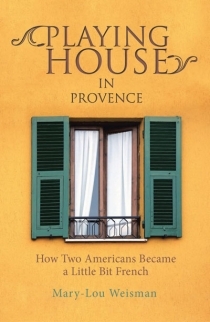 Funnier, smarter, and more wickedly honest than any memoir about Provence.